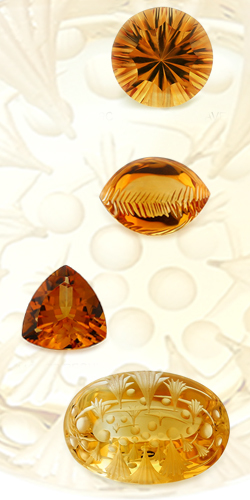 Many people have come to know and love this stone under the name gold topaz, or Madeira or Spanish topaz, although in actual fact it has very little in common with the higher-quality gemstone topaz - except for a few nuances of colour. Thus the history of the citrine is closely interwoven with that of the topaz, and coincides with it completely when it comes to the interpretation of alleged miraculous powers. However, the citrine is a member of the large quartz family, a family which, with its multitude of colours and very various structures, offers gemstone lovers almost everything their hearts desire in terms of adornment and decoration, from absolutely clear rock crystal to black onyx. And it does so at prices which are by no means unaffordable. The name is derived from the colour - the yellow of the lemon - , although the most sought-after stones have a clear, radiant yellowish to brownish red. Like all crystal quartzes, the citrine has a hardness of 7 on the Mohs scale and is thus, to a large extent, insensitive to scratches. It won't immediately take offence at being knocked about either, since its cleavage properties are non-existent. Even if their refractive index is relatively low, the yellow stones have just that mellow, warm tone that seems to have captured the last glow of autumn. Like golden Rhine wine or sparkling Madeira, heavy and sweet, citrine jewellery shimmers and brings a hint of sunshine to those dull November days.